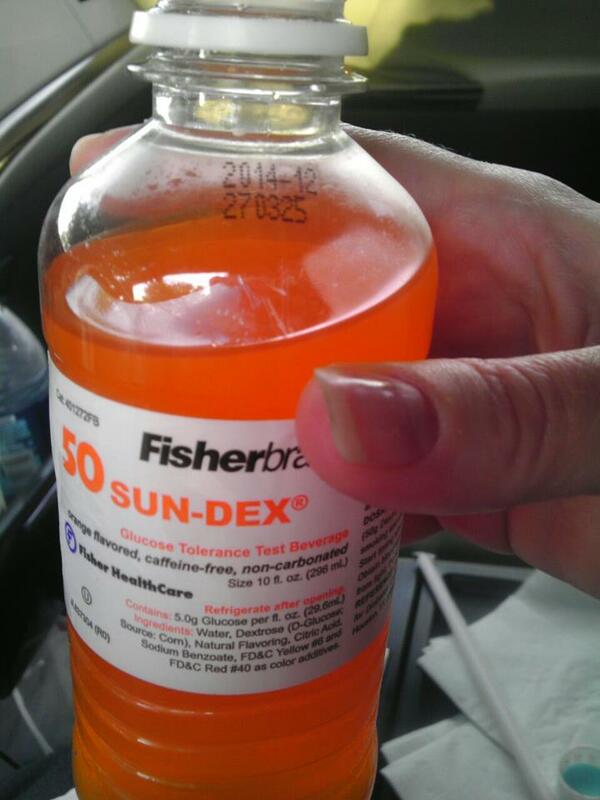 Now, the glucose test in itself is probably bad enough, but mine just so happened to have even worse timing. The suggested day for testing was the morning after a sleep study that had also been ordered. I have thyroid issues and they wanted to see if any issues may also be coming from or compounded from sleep apnea. Of course the testing was needed in week 17, along with my sugar test!! I won’t go into lots of detail on the sleep study only to say there was NO sleep involved! I would be highly surprised if they got any conclusive data since I seriously am not sure I slept more than 45 minutes straight. How they think ANYONE can sleep with 15 probes attached to their body – from my legs to my side to my throat to my face to my scalp – and ALL connected, making movement uncomfortable and really impossible at times, is beyond me. I get what they need to study, but there has to be a better way than what they have come up with – I mean two nights with half as many probes at once would be better. Or seriously, in this day and age, how are the probes not wireless!! If my phone can stream TV, I am sure a medical facility can pick up on a transmission of brain waves without wires! Oh, I digress. So with little sleep and no patience, I leave the (no) sleep study and head to McDonald’s to find a protein-only breakfast. I settle for a bacon, egg and cheese biscuit and a water. Note to self, eggs have made me sick this whole pregnancy, why would you choose eggs on a morning like today?!?! I go to the lab and park outside and attempt to remove the biscuit from my sandwich, which is easier said than done given the cheese. I reluctantly throw the biscuit in the parking lot and watch the birds feast on my favorite part and attempt to choke down the remainder. Now for dessert. I had the (no) sleep clinic folks keep my glucose drink in the fridge, but its been about 30 minutes now and it is starting to warm up, which isn’t ideal. I gingerly take a sip and am quite surprised it tastes ok, like a flat Sunkist soda, which I kinda like. I start gulping since I have been told to drink it all within 5 minutes, and have to stop half-way through. It has hit my tummy, mixed with that dang egg and it isn’t happy! I stare at the bottle for at least 60 seconds before deciding to call upon my 25-year-old self. The girl who could party with the best of ’em, shoot tequila, chug red bull and swig down Jager. I got this……. At the end of exactly six minutes, the orange bottle is empty, I am queasy and gagging and I still have 45 minutes to sit and wait to go in the lab office. Yes, my 25-year-old self did good, and it was just like old times. After the blood work was complete, I headed home and took a nice, long 4-hour nap. I woke still a bit queasy, but hey, that could still be the morning/all-day sickness I continue to have. Now, I wait and pray I pass the test. Cause not even my 25-year-old self wants to chug on and off for 3 hours for a re-take!